This 26 cu. 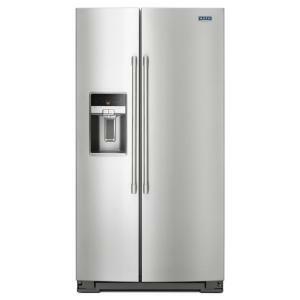 ft. refrigerator is built tough enough for any kitchen with the power to back it up. The 10-year limited parts warranty on the compressor and fingerprint resistant stainless steel mean they will weather the worst years of wear, while our gallon door bins are strong enough to hold jugs and bottles in the door. Plus, durable max capacity glass shelves and a humidity-controlled FRESHLOCK crisper make managing your food and drinks a breeze. These refrigerators will keep it all cool without breaking a sweat. Kitchen Goods, a unit of Dominant Systems Corporation, uses sophisticated crawler software to search the web looking for great product deals online. For this page, related items include products we find that match the following keywords: "Refrigerator" at our vendor partner Home Depot. Maytag 36 inch W 26 cu. ft. Side by Side Refrigerator in Fingerprint Resistant Stainless Steel is one of 272 Refrigerators and related products available for sale through Kitchengoods.com, If you have any questions on this product, please give us a call at 734-971-1210 during the hours of 9am - 5pm EST for assistance. Thank you for shopping at Kitchen Goods, your place for kitchen gadgets, and more!